To say Kieron Pollard makes his presence felt on the field would be an understatement. We have seen the West Indies pluck some stunning catches from thin air and save some crucial boundaries in the slog overs. On Monday, he proved he’s got a little more to show. 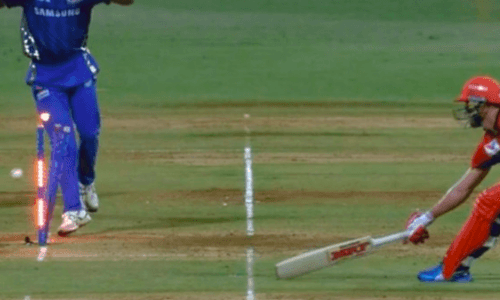 Playing for Mumbai Indians against Royal Challengers Bangalore in an Indian Premier League clash, Pollard effected a run-out of AB de Villiers. in stunning fashion. During the last over of Bangalore’s innings, de Villiers hit a full-ish delivery from Lasith Malinga to long-on, where Pollard was deployed. The batsmen ran the first run fast as de Villiers called for a second, a call which looked more of a tease though. Pollard, with the powerful arm that he has, fired the throw straight at the stumps, catching de Villiers (75 off 51 balls) just short of the crease. Bangalore went on to score 171-7 in 20 overs. In response, Mumbai chased the target with five wickets and an over to spare, thanks to some ordinary bowling from their opponents.